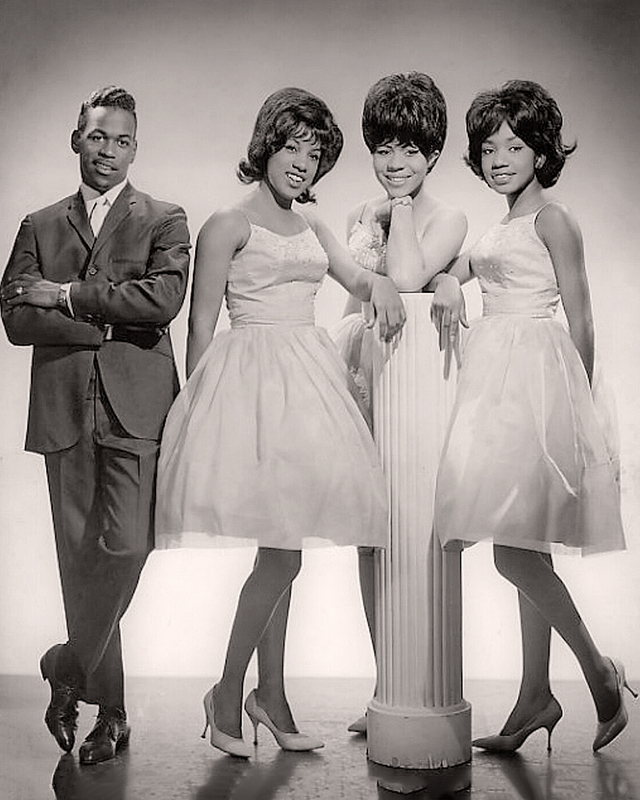 The three Brickley sisters, Audrey, Jean and Shirley and two friends, Rosetta Hightower and Marlena Davis composed the mid-50s Philadelphia group, Audrey and the Teenettes. While they were students at Overland Junior High, the group was asked to perform at a local nightclub. Mother Brickley put her foot down and wouldn’t allow 13-year old Audrey to perform. Both Audrey and sister Jean, both still in junior high, withdrew from the group leaving just a trio. Stephen Caldwell was the lead singer for an all-male group, The Romeos. With the girls needing another singer, the 18-year old Caldwell was invited to a sing-a-long in 1959. “Shirley lived two doors from me, Marlena about four blocks from me and Rosetta was just six blocks away. One Saturday after doing chores, the girls were on the porch harmonizing when I picked up the lead on Daddy’s Home.” (1) Impressed, the girls invited Caldwell to join the group. In return, it was Berry who arranged the Orlons audition with Kal Mann, a co-founder and songwriter at Cameo-Parkway Records. C-P had an all-star roster in the late 50s and early 60s. Chubby Checker led the pack with a number of dance hits anchored by The Twist; Bobby Rydell was the teen idol with hits like Kissin’ Time and Swingin’ School while The Dovells hit the ground running with Bristol Stomp and You Can’t Sit Down. Later, Dee Dee Sharp fed the world Mashed Potatoes followed by (what else?) Gravy (For My Mashed Potatoes). Finally, the smooth sounds of The Tymes with So Much In Love filled the airwaves in 1963. 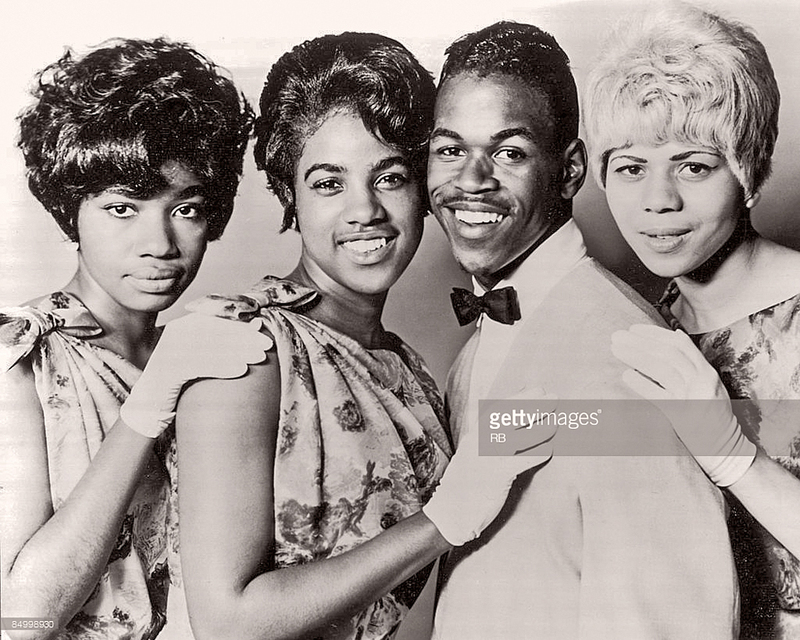 L-R: Rosetta Hightower, Marlena Davis, Stephen Caldwell and Shirley Brickley. “At our first audition in January of 1960, I did (the lead on) four or five songs. They liked us but they were looking for a female lead. We took a few months and each of the girls learned two songs,” said Caldwell. “That was the hardest part. None of them wanted to sing lead. I had to push, push, push.” (3) What finally convinced the trio was that one of them had to lead or there was no deal. After three auditions, the Orlons were finally signed to a deal with Cameo-Parkway in October. At first, the label couldn’t decide which of the three girls would sing lead. Mann knew each of the three ladies could effectively handle the lead but it was a matter of matching each girl with a song. Marlena was given the initial effort with a Soldier Boy type song, I’ll Be True. The song did well locally but couldn’t break nationally. Cameo next tried Shirley on the lead for the group’s next release, Happy Birthday, Mr. 21 backed with Please Let It Be Me. Both were ballads and Cameo failed to land a hit with either side. With no big hits to their credit, the Orlons kept their dream alive performing locally and singing background on records for other Cameo artists. Dee Dee Sharp scored big on her first try—a duet with Chubby Checker called Slow Twistin’ in the spring of 1962. Cameo had a song in mind for her first solo—a dance tune called Mashed Potatoes. Vocalists were needed for the background and the Orlons were asked to do it. Steve and Marlena refused believing the label was spending too much time on Dee Dee and not enough on the Orlons. “When The Wah-Watusi took off, we knew Rose was the spirit of the group. She was the star. It made us realize we had talent and that we were able to produce for the company,” Caldwell remembered. “It was a remarkable thing to have a record that sold a million copies. However, it didn’t reflect in the funds we received.” (7) Like many other one-sided record contracts signed by artists in those days, Cameo-Parkway had a clause that awarded them repayment for promotion, transportation, lodging, etc, if and when a song became a hit. With the two previous misses, the Orlons were in a deep hole for expenses. The Wah-Watusi sold a million copies and netted the group none of the 2-3 percent of the royalties promised. Mann, Lowe and arranger/songwriter Dave Appell concerned only with producing hits and making money, stuck with formula for the next Orlons release, Don’t Hang Up. During the recording session, Steve sang the tagline responses of Oh, No! after Rosetta’s “…Oh don’t you do it now…” On the playback of a take, Steve sang it in a frog-like voice. “Who did that? What was that?” asked the voice behind the glass. Caldwell answered, “That’s just a voice I do.” The response was, “We’re gonna play it back and you put that (voice) in there.” Caldwell’s eyes watered and his throat became sore with the effort, but the trick was perfected. (7) His Oh, No’s became a signature part of the song. 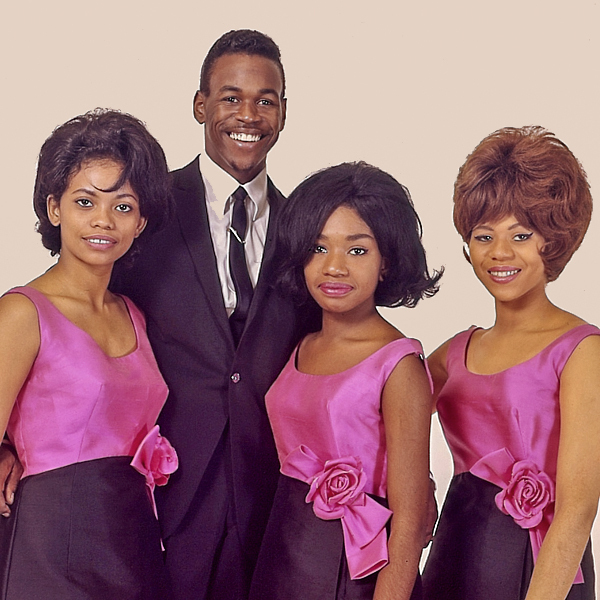 L-R: Stephen Caldwell, Marlena Davis, Shirley Brickley and Rosetta Hightower. Photo courtesy of Getty Images/Michael Ochs Archive. Clark was also a close friend of Cameo-Parkway and its stable of artists. With his Philly-based nationally syndicated American Bandstand, the dance show for teens around the country, Clark had a special appreciation of groups from the city of brotherly love, as he would help their careers any way he could. Reciprocating, when Clark needed an artist or group to fill in when a scheduled act couldn’t make the show, he could count on many of the C-P roster to appear at a moment’s notice. The Orlons greeted 1963 with another top ten hit in February with South Street. Originally titled Sansome Street, which was the jazz street of Philadelphia, the title was changed to South Street, designated in song as the hippest street in town even though it was the address of pawn shops, men’s stores and shoe stores. The song peaked at #3 on April 13th. (5) (6) With three consecutive top ten hits, the euphoria surrounding the Orlons should have been sky-high. Instead, it was nothing more than a short term buzz. Two follow-ups, Not Me and Cross Fire! landed in the top twenty at 12 and 19 respectively. The placement started a trend of releases heading reaching the lower numbers of the chart. The next four singles placed in the chart’s bottom 50. So, what happened? There were three distinct reasons. The British Invasion took hold in late 1963 and early 1964 and caused many American acts to lose their place among the American record-buying public. American Bandstand uprooted and moved to Los Angeles thereby removing the source for the label’s national exposure. The wear and tear of the long tours and recording dates took their toll. As a result, Marlena was first to go as she left the group in late 1963 or early 1964 depending on which source one follows. Caldwell followed in late 1965. Rosetta and Shirley added Sandy Person and relocated to the Calla label. There were a few more personnel changes before the group finally called it quits in 1968. Rosetta Hightower stayed in England after the Orlons disbanded after their final tour in the UK. She had a successful career as a soloist and was in demand as a session artist for Joe Cocker. She died in 2014 at age 70. Marlena Davis worked as an executive secretary. In 1988, Marlena and Caldwell added two new members and toured as the Orlons until Davis’ death from lung cancer in 1993. She was 48 years old. Shirley Brickley was shot and killed in her home by an intruder in 1977. She was 32 years old at the time. Stephen Caldwell became a shop steward for the bus drivers’ trade union in Philadelphia and also served on the Philadelphia Board of Education for 29 years before reuniting the Orlons in 1988. Don't Hang Up by the Orlons in mono. Revisit 1963 and learn the South Street courtesy of the dancers on American Bandstand. 1) Homer, Sheree, Dig That Beat! Interviews with Musicians at the Root of Rock ’n’ Roll, 2015, Page 22. 2) Buehler, Pati, Broadway World Pennsylvania, Spotlight On: Philly's Own The Original Orlons, July 18, 2016, Link. 3) Homer, Sheree, Dig That Beat! Interviews with Musicians at the Root of Rock ’n’ Roll, 2015, Page 23. 4) Clemente, John, Girl Groups: Fabulous Females Who Rocked the World, June 24, 2013, Page 344. 5) Whitburn Joel, Top Pop Singles 1955-2002, Page 527. 6) Whitburn, Joel, Billboard Hot 100 Charts The Sixties. 7) Homer, Sheree, Dig That Beat! Interviews with Musicians at the Root of Rock ’n’ Roll, 2015, Page 24-25.